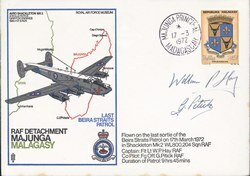 This commemorative cover, issued on 17 March 1972, marks the last sortie flown by the Beira Straits Patrol. The cover itself was flown on the 9hr45min sortie and is signed by both the captain, Flight Lieutenant William P. Hay, and the co-pilot, Flying Officer G. Pitick. The aircraft was an Avro Shackleton MK2 WL800 (with four 1,960-horsepower Rolls Royce Griffon engines), of 204 Squadron RAF, an illustration of which appears on the cover against an outline map of Madagascar and the east African coast. There is one stamp, depicting the coat of arms of Tananarive (Antananarivo), a design issued on 3 December 1963 with a face value of 25 francs (Michel catalogue code: MG 515; Yvert et Tellier catalogue code: MG 392). 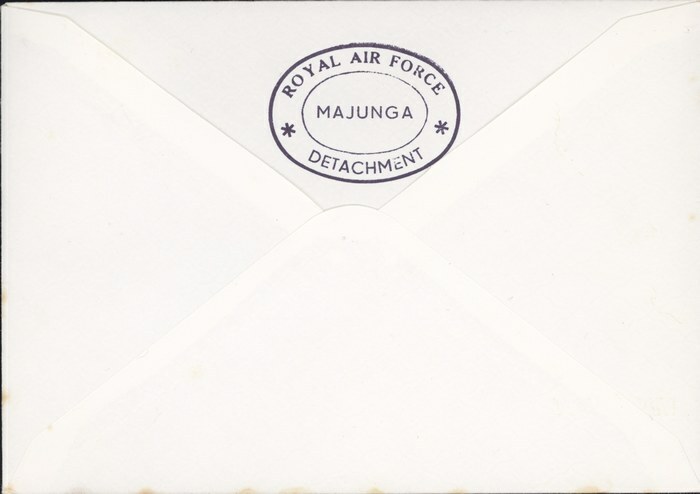 The stamp is cancelled with a postmark from Majunga (Mahajanga) and dated 17 March 1972. 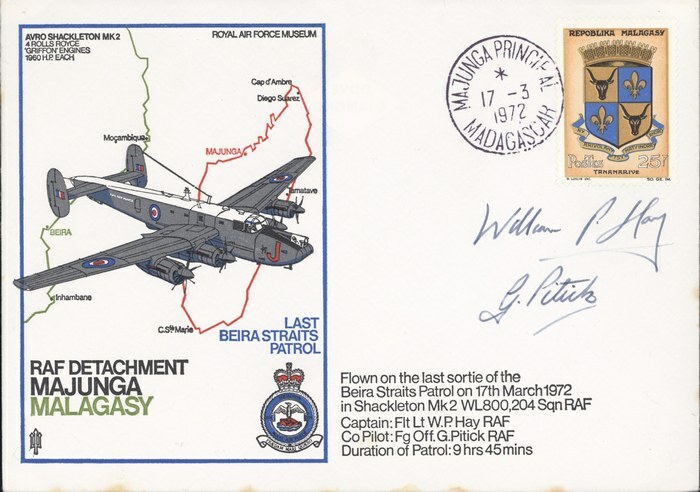 The RAF Majunga Detachment comprised two Shackleton aircraft based at the airfield close to the port of Mahajanga, sent there in March 1966 to assist the British Royal Navy's Beira patrol by carrying out aerial surveillance of the Mozambique Channel. The purpose of the operation was to enforce the oil blockade against Rhodesia. In March 1972 the RAF Majunga Detachment was wound up, and the following month No 204 Squadron disbanded, but the Royal Navy's Beira Patrol continued until June 1975.